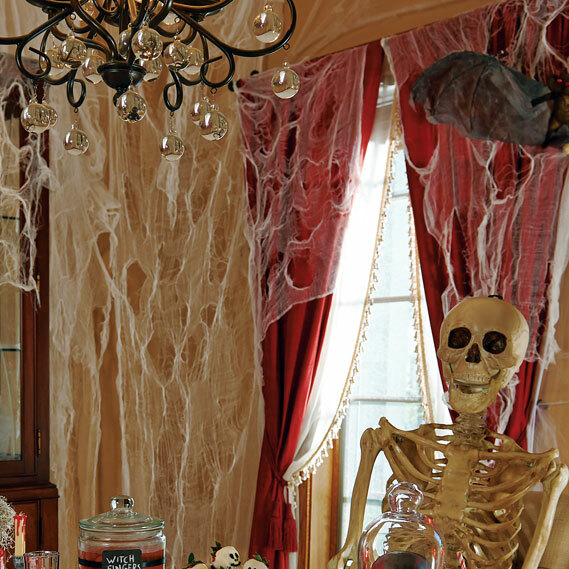 Ready for round two of our Halloween decorating ideas series? 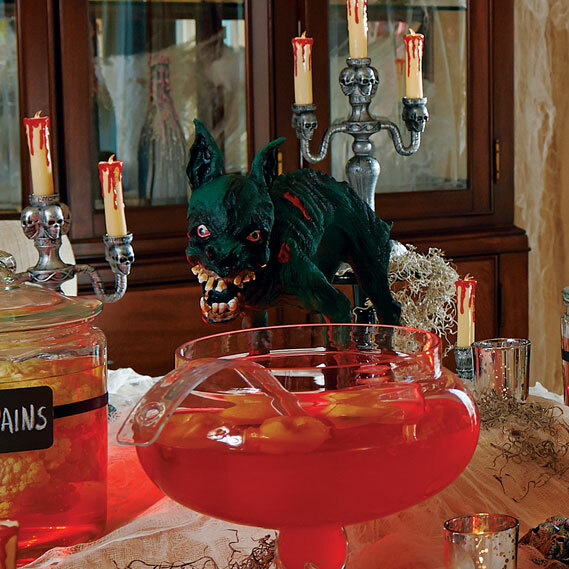 Last time, we showed off decorations all about “Eerie Elegance” – a mashup of vintage style and classic horror that we used to decorate a Halloween party indoors as well as out. Check out part one and part two of that theme if you didn’t catch it the first time around. Today, we’re bringing you ideas for a Haunted House theme that’s even more scary. Keep on reading to discover more. Apothecary jars make easy props. 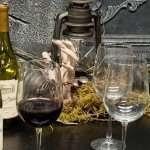 Lots of craft stores sell unique-looking glassware like this, and they’re fantastic for using as DIY Halloween decorations. 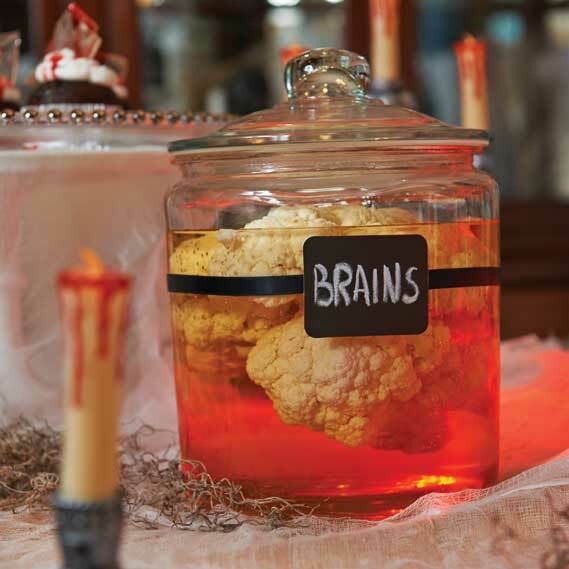 Here, we’ve made one into an experimental laboratory specimen with a fake brain and some red-colored water. Styrofoam skulls and bones work great for decorating ideas like this, too. Use some black paper and chalk-written labels for a creepy look. Problems filling out your guest list? 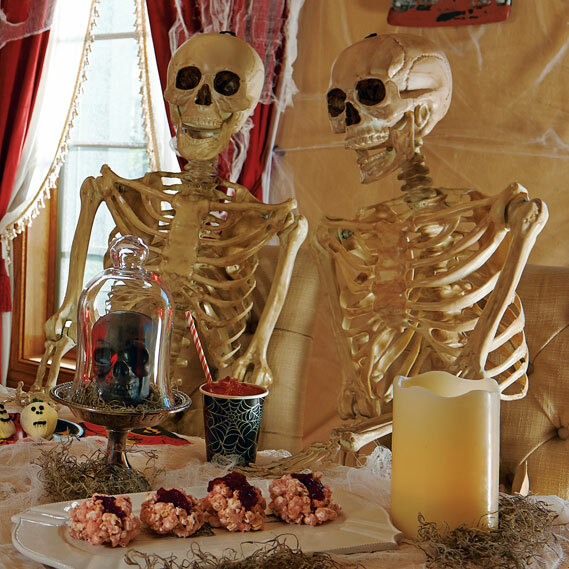 Use full size skeleton props to add some extra character to your haunted house. Not only can these guys be easily posed into any position, but they’re great listeners, too. Don’t stop with the creepy props. On any other day of the year, a flesh-eating zombie dog at the dinner table would just be distasteful. For Halloween, though, he makes a great centerpiece. To step up the gore even more, use other zombie props like this crawling zombie torso or mummified cat. It doesn’t have to be dark to be scary. By making use of semi-transparent materials like fake spider webs and different colors of gauzy, gossamer cloth, you can create a haunting party atmosphere without needing to turn out all the lights. Cover your lighting fixtures, so that they cast an eerie glow and spooky shadows. Hang them over windows, so that the natural light coming in gets a supernatural appearance. 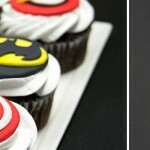 Make your sweets worth screaming for. 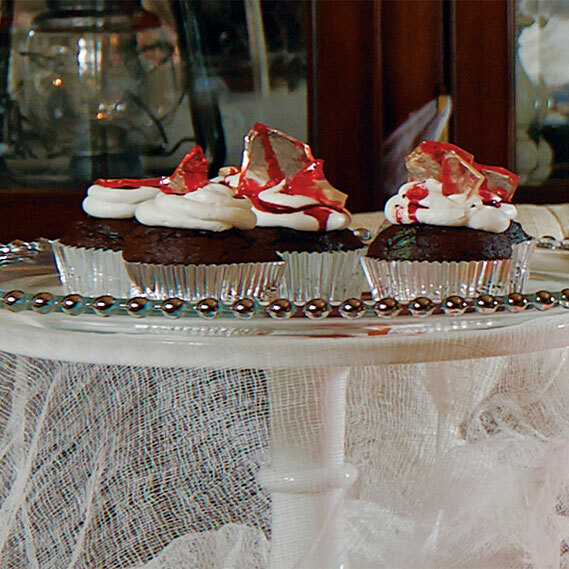 To give a plate of chocolate cupcakes a tasty horror twist, we embedded a few shards of homemade sugar glass candy into the cakes and topped with red food coloring. Glass candy can be made with just three ingredients: sugar, water, and corn syrup. Here’s a recipe – the resulting product is similar to peanut brittle, sans peanuts, and makes a great visual addition to any Halloween cupcakes or desserts. 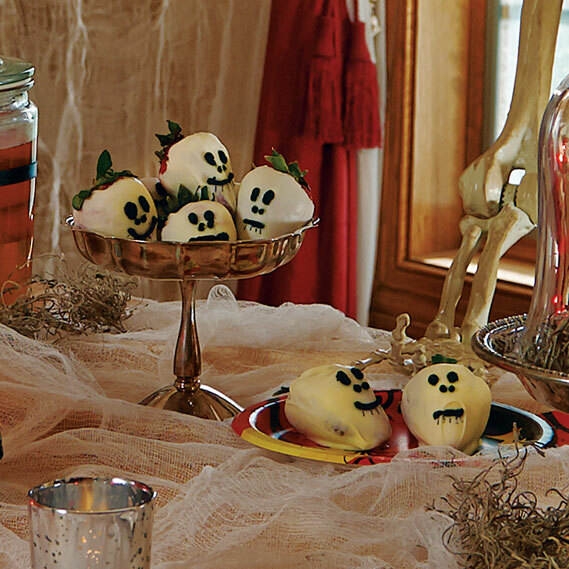 Serve up some strawberry skulls. Here’s another easy Halloween food idea that can make a big impression at any party – chocolate-covered strawberry skull treats! After dipping the berries in melted white chocolate, you can pipe some black frosting or decorating chocolate to create some skull faces like we did. Or, if you’re more artistically inclined, you can go all out with some Dia de los Muertos sugar skull-inspired designs. That’s all the tips we have for today, but we’re not quite done with this Halloween theme yet. Next time, we’ll be showing off some more outdoor Halloween decorations. 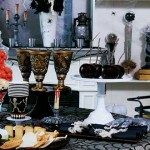 In the meantime, you can also learn more about our top 10 Halloween decorating ideas here. If you liked this post and want to see more like it, then let us know what kind of Halloween ideas we should show off next – message us on Facebook, on Pinterest, or on Twitter @BuyCostumes to tell us what you think. 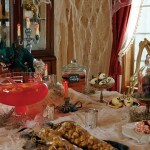 Shop all Halloween decorations and props on BuyCostumes.com.